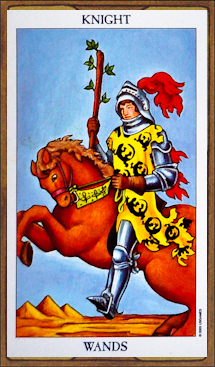 While the Knight of Wands is indicative of moving forward on an idea with lots of energy and passion, ready for adventure, the fact that the Knight of Wands is shown going in the opposite direction of the other Knights in the Tarot deck has led me to read this card’s appearance as being one of taking two steps forward, one back. Eventually, you’ll find the right path and your struggles until then won’t be wasted. But, whenever the Knight of Wands appears, I warn my clients to be prepared for setbacks. Mostly small setbacks, but just be aware. The good news is that The Knight of Wands is fearless. So, if you’re ready to take on the world, then do so. Just be aware that confidence can, sometimes, masquerade foolishness, hide the need to act impulsively. So, be sure and think twice, maybe a third time, before you make any lasting decisions or pronouncements. Always have a plan in place; always have a backup plan in place (and, maybe a backup plan to your backup plan). All of the Knights in the Tarot deck represent movement of some sort. With the Knight of Wands representing fire signs, it means that this card is all about action. Just make sure you don’t rush your actions into an actual fire. Pace yourself. Use that fire energy to stay motivated, especially if you do encounter a setback or two. Be confident, though, that your plan is one that will eventually propel you to where you next want to be. So, be bold, be careful, and don’t rush anything. It’s always good to start any new venture with confidence and this goes for a New Year, as well. 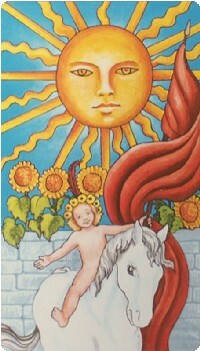 Whenever I see The Sun in a querent’s reading, I’m always delighted, as this card represents success on many levels. You feel good, you look good, people look to you for ideas and advice. You are the culmination of the best you’ve ever been. Even if you’re not a naturally warm and effusive person, this month you might find yourself acting a little out of your normal range. Be open to all positive opportunities and people and start out 2017 with joy and happiness. 2017 is a 1 year, as 2+0+1+7 equals 10, which equals 1+1, which equals 1. This year brings with it new energy, so be on the lookout for lots of luck and love and success. Even if you don’t see it in January, know that this is the energy surrounding you and wear it like a lucky wrap! 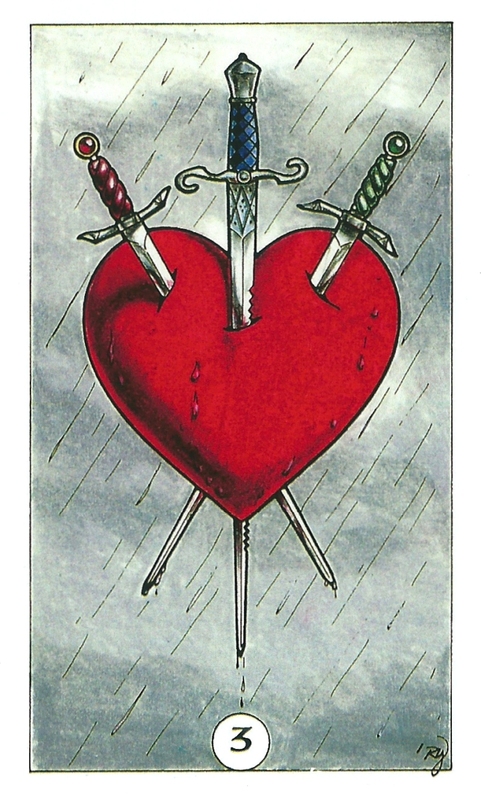 The Three of Swords is one of the saddest and most painful cards in the Tarot Deck. It’s all about loss and grief, and even, physical pain. 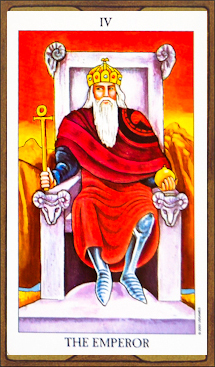 When this card appears, it’s usually an indication that what you’re asking about will not have a positive ending. I also read the card as an acknowledgement of heart-related diseases and lost pregnancies. But, it’s overarching energy is that of pain and sorrow. I guess we all need to be prepared for a tough February. Now, pulling the Three of Swords for this month doesn’t mean that it will be a tough month for everyone. But, be prepared. There’s not much more you can do but steel yourself for the worst and if something bad happens, hopefully, it won’t be completely unexpected. The good news? This is the shortest month of the year! When I pulled this card, an image of Donald Trump flashed around my brain. Trump is the embodiment of a reversed Emperor. Instead of being a father figure, offering stability to all and protecting people and ensuring security, he is all about harming whoever he pleases, while doing whatever he wants, and all the while, fleecing people, with no conscience, to feel his greedy, dark, empty soul. However, while our country might by dying because of this horror show, this man I’m not entirely sure was actually elected, we can all hug the comfort that The Emperor brings to March. Whether you’re looking to someone for guidance and support or are offering this kind of strength to others, know that The Emperor energy wants to make sure that all people and animals are safe and happy and are feeling good. If you’re not feeling safe or happy, know that there are all kinds of people and organizations that exist to offer solace and help and comfort. If you’re one of the comfort-givers, remember that you need to take time for yourself and make sure that you’re rested and eating healthily and getting plenty of sleep. It’s difficult to take care of others, so you always have to take care of you first. But, know how much comfort you bring to others. Recognize that you lessen pain and sorrow, and know that you are the embodiment of who we should all want to be. Now, The Emperor also deals with rules and regulations. This, in and of itself, is not a bad thing. But, with people like Trump and His Band of Regressive White Boys (and a few tokens) in charge, be prepared to see a lot of good rules and regulations trampled, while new, nasty, harsh rules could be implemented that could harm all different groups of people. Even if (I suspect, when) this happens, make sure that you are there for others or seek out others for help. Now, more than ever, we need the core of The Emperor to manifest! And, The Emperor can also be a harbinger of order. Again, we need more than our fair share of this energy right now. With order, comes possibilities. So, if an opportunity appears, you know what to do! And, if you are in any kind of management role in the workplace, use your power wisely. Guide, don’t crush. The same holds true for anyone who is in charge of children, the elderly, the disabled, or the sick. Remember that The Emperor provides comfort and you are in a special place and need to offer the best kind of care and support. No matter what happens this month in the outside world, make sure your personal world is sustained and maintained. Let me know how the rest of 2016 and the beginning of 2017 goes for you. I'll continue doing a monthly reading on top of the quarterly readings, and together, we can figure out what all the interspersing or battling energies mean for us! Happy Holidays and Happy 2017!